How many Lizzie Borden-themed bed-and-breakfasts in Fall River, Massachusetts, is too many? Is it four? Is it five? Is it 16? I am not sure, but for now, it appears the gambling number is two, as Borden’s second home is set to become sleeping quarters for weary travelers and fans of unsolved mysteries. This is bad news for the ghosts that live there if they are friendly, but good news for the mean ones who love haunting! According to the Associated Press, Maplecroft, the 14-room Fall River mansion Borden lived in after she was acquitted in 1893 of axe murdering her father and stepmother, is set to open as a bed-and-breakfast within the next month or so. 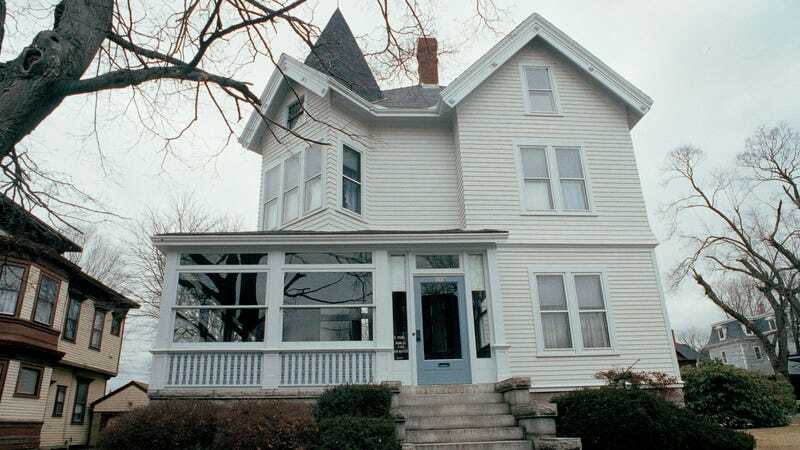 The house in which the murders took place, which is located about a four-minute drive from Maplecroft, is now the allegedly haunted Lizzie Borden Bed and Breakfast, and its owners and Maplecroft’s are now one and the same. Maplecroft was on the market for $799,000 last fall, and according to the Fall River Herald News, Lee Ann Wilber and Donald Woods, who own the aforementioned Lizzie Borden Bed and Breakfast, purchased it in February. They’ve spent the last few months restoring the 19th century Queen Anne Victorian, adding some modern updates and a sprinkler system, and readying the space for the same slew of visitors drawn to Borden’s other house down the road. “We’ve gotten a lot of emails,” Wilbur told the Herald News. Like the Lizzie Borden Bed and Breakfast, Wilber, Woods, and manager Ryan Woods plan to use Maplecroft to tell some of Borden’s story, though this house will be used to illustrate Borden’s later years, as well as to dig into her sister Emma, who co-owned Maplecroft and lived there with Borden until 1905. Borden stayed at the mansion until she died in 1927, and her funeral was held in the home. The Lizzie Borden Bed and Breakfast has had several reported ghost sightings. Meanwhile, Maplecroft had a number of owners and underwent a number of price reductions over the years, which could just be the market, OR a sign of more Spirits—we’ll have to see what the new inn’s guests say after a couple of overnights. But look, all old houses have ghosts, whether they housed suspected (but acquitted!) axe murderers or not. Of this I am certain, hence why I will always live in apartments, which are only haunted by roaches.